The African wild cat was created by God on Day 6 of Creation and is believed to be first domesticated by the Ancient Egyptians. 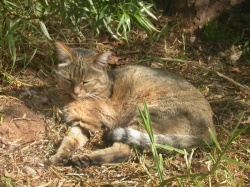 It is thought to be related to the European wild cat, and has hybridized with domestic cats so much that it is difficult to find pure genetic specimens except for very remote areas. Many believe it to be the ancestor of the domestic cat. It is presently found most often in South Africa and the southern African nations. It is interesting to creationists as an example of variation within a created kind. They generally live by themselves except when mating, and both the males and females have territories that they defend strenuously. Births average 3 kittens born after 65 days of gestation usually in September to March which is the wet season when food is more plentiful. Kittens are born blind, and stay with their mother for about 6 months.